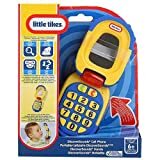 We just got this cell phone (rated for 6+ months) for our 11 month old son about a week ago. It has been dropped from heights, thrown across the room, beaten onto the cement outside, and drooled on – a lot. And I can’t find a scratch on it. It’s very durable. This toy is much quieter than many other child toys we have. This is a huge thing for us since some toys just seem SO loud. It has a child saying the numbers when the numbers are pressed and has three set sounds for each of the green and red phone buttons. I know this is still his newest toy but my son seems to like it very much. He gets ahold of my cell phone about half as much since we got this one. He likes dragging it around with him so that must be a five star infant rating! This phone has taken a beating over time and doesn’t have a scratch on it. The thing I love most of all is the volume. It is pretty quiet. My baby can hear it just fine and press the buttons over and over with out it getting on anyone’s nerves. I wish this phone was louder. I know as a prarent, we have lots of loud toys but this toy could be louder. I think it would make the child want to play with it more.